We're a fully mobile flooring company. 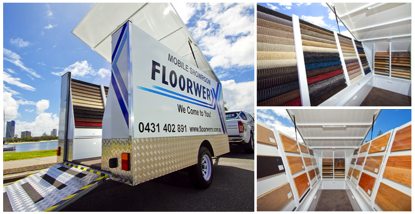 So, when you want to pick out a flooring product - whether it's carpet for the Gold Coast, loose lay vinyl flooring in South Brisbane or more - you call us and we come to you for free with our walk-in mobile showroom. You choose the product right on site. We service the Gold Coast area, from Tweed Heads to South Brisbane. Best of all, you'll save time! A great selection of carpets, vinyl planks, sheet vinyl, engineered timber flooring and more flooring options for all areas of your home! There's no running around on your part and you get to choose from over 200 samples of carpet or vinyl. Best of all, you get to save your valuable time. Check out some of our product options online or just give us a call and we'll swing by!